Made by Fluid Industries and approved by Atmomixani. 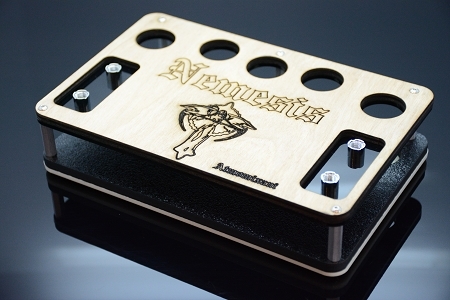 Our Nemesis stand measures 8"x5"x2". It features (4) 510 connectors for storage or presentation of your atomizers and (5) 24.5mm round cutouts for your mods. Top plate is laser cut wood with "Nemisis", the World Famous Death Angel Logo, and "Atmomixani" laser engraved in it. Lower deck is constructed of laser cut haircell ABS and 2 baseplates are laser cut from acrylic. Aluminum hex standoffs and Stainless Steel hardware. This stand is very sturdy. This stand comes fully assembled and has 5 non-slip rubber feet.